Sunny Side Up. You see it on your breakfast table almost every other day. You also see a version of it on your favourite cooking show. But why is it that you always end up with an oozing yolk, and they get it right each time they crack open an egg over the pan? You have the same egg in hand, you have cracked it in the same way, but your yolk just refuses to stay firm in its place. The sunny side up can be perfected with the help of a few tricks and we are here to help you with just that. The sunny side up is a form of fried egg, a common breakfast option across the globe, In the United States, there are several different terms used to describe the preparation of fried eggs like Over Medium (where the egg is cooked on both sides; the yolk is cooked too, but soft and near liquid at the center) or the Over Hard (where the egg is fried on both the sides, with the yolk broken, until it hardens and sets) and finally the Sunny Side Up which is cooked only on one side, until the egg white is set but the yolk remains liquid. In the southern part of India, fried eggs are also referred to as the ‘bulls-eye’, ‘half boil’ or ‘egg half fry’. In central and northern regions, it is also known as ‘single-fried’ or ‘half fry bina palti‘ (without turning). The sunny side up can be enjoyed alone or also with herbs and pepper. It can also be served as an accompaniment with a variety of dishes like noodles, dosa or even a parantha. 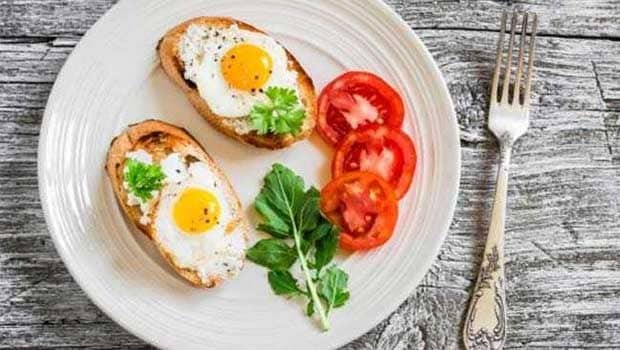 Now, about getting the crisp whites and firm yolk right, these fool proof hacks wil help you get the perfect sunny side up. 1. Get some fresh eggs. The fresher the eggs, the better are the chances of your white and yolk holding up. 2. Put a teaspoon of unsalted butter into the skillet to grease the pan well. Adding enough fat helps the whites to cook before the yolk starts to harden itself. 3. For best results, heat a skillet on low heat. Cook the egg on medium heat for about 30 seconds and then reduce the heat for another minute. This will help prevent overcooking the yolk. 4. You can also tilt the pan slightly and spoon out some of the excess butter and pour it over the egg whites so that they cook evenly. When the egg whites become firm, it means that they have been cooked properly, and your sunny side up is ready to be plated. 5. Place a lid over the skillet for a minute while the egg cooks. This prevents the yolk from oozing out or being overcooked. Here is how I prepare my sunny side up. See if you can take a cue and relish it as much as I do. Black pepper and oregano to taste. 1. Heat your frying pan on medium to low heat and add oil and butter to coat the bottom of a large non-stick pan. 2 Crack the egg into the pan. Make sure the temperature is low. If the oil starts to spit, it means that the pan is a bit too hot, so turn the heat down. Let the egg cook until the whites are set. Make sure that the yolk is still runny. A longer cook time can harden the yolk. 3. Once it is ready, remove the pan from the heat and take the egg out with the help of a spatula. Place it on a plate, sprinkle some black pepper, salt and oregano.